Hindu Mandir for the Hindu Communities in Bhutan are being built. “One mandir has already been built in South and one is under construction in Thimphu” Lyonchhen added. H.E. Puspa Kamal Dahal said that Bhutan and Nepal share similarities and added that there are many areas for cooperation between the two countries. His Excellency also thanked Bhutan for the rescue initiatives during the earthquake in Nepal in April 2015. “Living in the same region, we have to come together in times of disaster,” said Lyonchhen. Both Lyonchhen and H.E. Puspa Kamal Dahal agreed that through BBIN (Bhutan, Bangladesh, India and Nepal) sub regional initiatives can be taken forward. 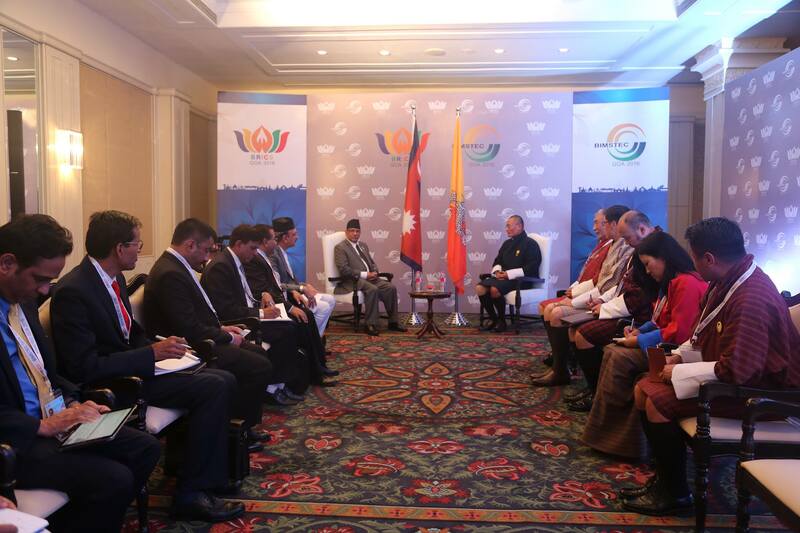 Among others, the meeting also saw discussion on trade and hydropower. On the invitation of H.E Narendra Modi, Prime Minister of India, Lyonchhen Tshering Tobgay arrived in Goa today to attend the BRICS – BIMSTEC Outreach Summit from 15-16 October 2016. On arrival at the Vasco da Gama airport , Goa, Lyonchhen was received by H.E M.J.Akbar, Minister of State for Foreign Affairs; H.E Avertano Furtado, Minister of Labour and Employment, State Government of Goa and other senior officials from the Ministry of External Affairs and State Government of Goa.